I went to Find Issues and then using the filter panel on the left said 'edit' and then chose 'ODF 1.2 Part 3 CD01' in Affects Versions and came up with the following display. I'm not sure if that answers your question or not? > Part 3" for the fixed-in-version seems more apt. > ODF 1.2 Part 3 CD 1 and the Public Review. > housekeeping and researching to avoid duplication. 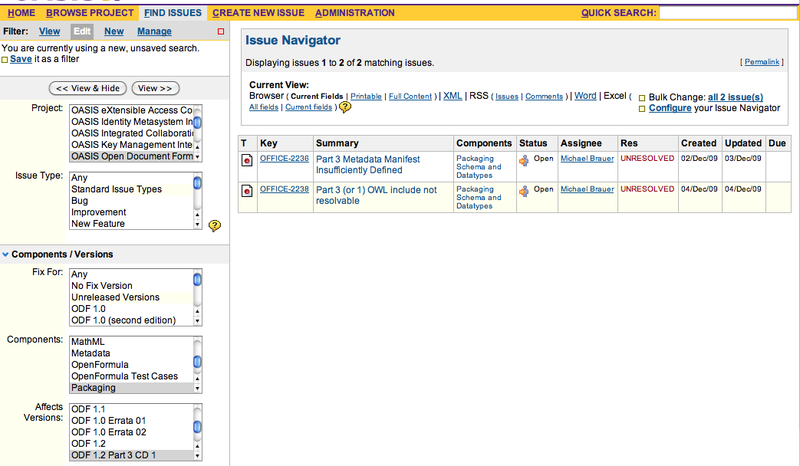 >> against ODF 1.2 Part 3 cd01 on the JIRA Summary page for the ODF TC. >> items (of which there appear to be 900 at the moment).